In a major policy shift, Hong Kong--the world's largest retail market for elephant ivory--says it may now consider banning its ivory trade. "The Government is open-minded on the ban on domestic trade" was how a spokesperson for Hong Kong's Agriculture, Fisheries and Conservation Department (AFCD) put it in an email to the South China Morning Post. The government's statement follows the recent release of a report by WildAid and the African Wildlife Foundation and undercover video by independent investigators provided to WildAid and WWF-Hong Kong, detailing how Hong Kong's legal ivory market fuels ivory smuggling and elephant poaching. 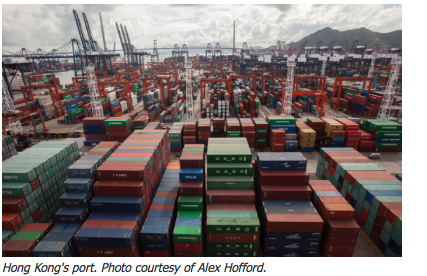 A decision by Hong Kong to shut down its domestic trade would be significant. 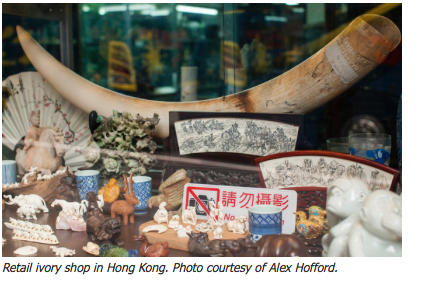 Hong Kong is at the heart of the ivory black market. Its container port is a prime transit point for ivory smuggled from Africa to Asia. Hong Kong officials confiscated roughly eight metric tons of ivory in 2013 and 2.2 tons in 2014. 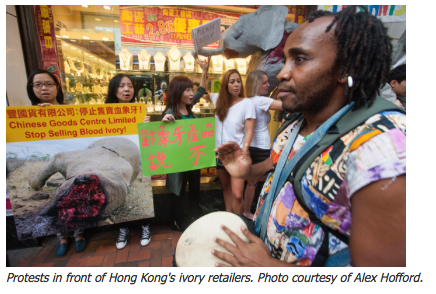 WildAid campaigner and report coauthor Alex Hofford said in reaction to the news, "We are delighted that the Hong Kong government is now adopting an open-minded approach to banning the ivory trade." But, he added, "To dovetail its position in line with China, the United States, and the rest of the world, the government needs to now start treating ivory in this city just like hard drugs--[by] initiating criminal and forensic investigations into the city's wildlife traders without delay. And it is time for AFCD's cursory inspections of meaningless bits of paper to end." A Hong Kong government spokesperson noted that an investigation was ongoing into the shady traders exposed in the undercover video--but that so far inspections have "revealed no irregularities as the ivory stock were either legal tusks with traceable markings or pre-ban  ivory that match with the records of AFCD. We are following up with investigation on each and every report. We are also in regular touch with the NGOs who are working to end the illegal ivory trade." According to the government, Hong Kong's control mechanisms over its domestic sale of ivory are "stricter than the requirements of CITES"--the international body that regulates wildlife trade.According to the spokesperson, all license holders "are subject to inspection" and license applications "are scrutinised against proof of legal acquisition and proper record of transaction by AFCD. The ivory covered by such licences and registered with the AFCD was imported into Hong Kong legally and in accordance with the requirements of CITES before the ban on international trade in ivory." In February 2015, China imposed a temporary, one-year ban on imports of carved ivory. In May, China said it would "strictly control ivory processing and trade until the commercial processing and sale of ivory and its products are eventually halted." And during Chinese President Xi Jinping's visit to the U.S. in late September, he and President Barack Obama announced that both countries would "take significant and timely steps to halt the domestic commercial trade of ivory." Hong Kong's potential policy shift is also a response to a growing movement within the city for a ban. Protests and petitions during 2014 and 2015 prompted Hong Kong's top ivory retailers to stop selling ivory products in their stores. Then, in March 2015, 32 Hong Kong deputies submitted a bill to the Standing Committee of China's National People's Congress to ban China's legal ivory trade. A survey by the University of Hong Kong released in May 2015 found that an overwhelming majority--75 percent--of Hong Kong's population supported, or strongly supported, a ban on ivory sales. Hong Kong lawmaker Elizabeth Quat, who for the past two years has pressed for a ban, calls the policy change a breakthrough. But, she says, "being open-minded isn't nearly enough. To implement a law in Hong Kong requires a certain process, so I now call for the government to start this process without delay." She hopes the government takes action rather than "simply observing how this would develop, because time is running out for the elephants." This is an excerpt of an article on National Geographic titled "Hong Kong 'Open-Minded' to Banning its Ivory Trade" and was published with permission. For full article, please click here.